Those beautiful new quartz countertops that you just had installed are a true asset to your home, but sometimes they are going to require a little work to keep looking their best. The beautiful, gleaming surface can really upgrade the look of your kitchen. Yet, without proper care, you can quickly stain and mar that finish. 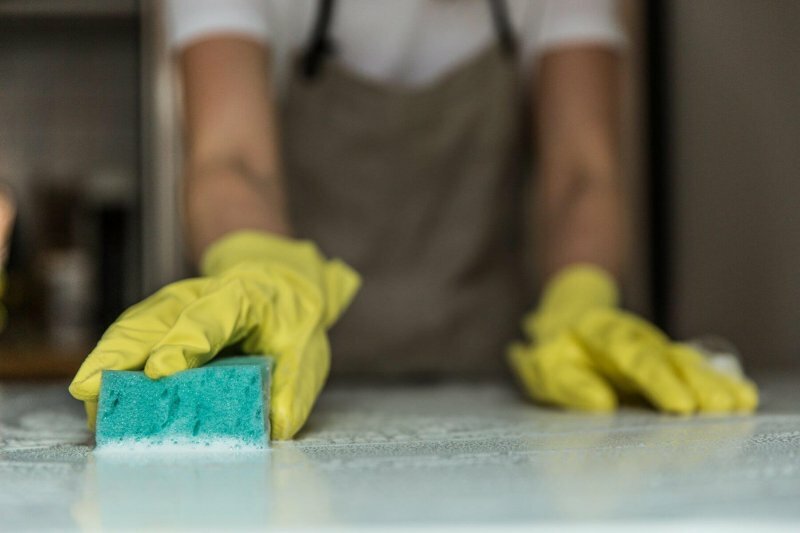 If you want to keep your new quartz countertops looking their best as long as possible, these cleaning tips are crucial. Here are some tips to help you keep your quartz counters clean and glowing, so you can protect your investment and help ensure your counters are an asset to your home for many years to come. What Are Quartz Counters Made From? First, before you can understand why proper cleaning is so important, you must first understand the makeup of a quartz countertop. Most quartz countertops are not made from 100 percent quartz. About 10 percent of the countertop will be a binder, like polymeric or a cement-based product. The rest is made up of natural stone, which may or may not be quartz in its entirety. This is an engineered stone or compound stone design, and contains very little, if any, solid quartz. So why is this important to understand when you consider cleaning? It actually can help make cleaning just a little easier, because quartz is virtually pore-free. This means it will not easily soak up stains or bacteria, so you can keep the counters looking great much more easily. This makeup also means sanitizing the countertops does not require any caustic chemicals, because the counters have no pores for bacteria to lodge in. Even though quartz is non-porous, it can stain, and many foods can dull the finish substantially. To keep it looking as beautiful as possible for as long as possible, wipe up spills as soon as they occur. This is particularly important for items like tomato sauces or juice that are red or purple and have a high likelihood of staining. Simply wipe up the stain with a cloth or paper towel as quickly as you can once it occurs, and you will be able to protect the quartz. You also need to have a daily regimen for cleaning your quartz countertops, in order to keep them looking their best at all times. This will not take much time if you get into the habit of doing it every day. Here are the steps to take. First, remove all debris from the countertop surface. If you have problems with hardened food or liquids on the countertop, use a straight, flat piece of plastic, like a credit card or spatula, to scrape it off. Do not use a blade, as that could scratch the surface of the quartz. If you are not able to remove the food or liquid in this way, use a wet paper towel or cloth to lay on top of the stuck-on mess. After softening it slightly, it may come right off. Once you have removed any of the caked-on food or liquid, use a damp rag with a little dish soap to wipe down the countertops. This should remove all remaining residue and debris. Finally, thoroughly dry the surface to prevent water spots. What happens when soap and water are not sufficient? For hard-to-clean messes or for times when you want to be certain that your quartz is sanitary, make your own countertop cleaning mixture. Use a little dish soap and some rubbing alcohol, mixing three parts soap with one part alcohol and blending in warm water. This will clean and sanitize the surface without dulling the finish or damaging the look of your countertops. Of course, one of the draws of quartz countertops is the gleaming, bright finish. Make sure you keep this looking great and shiny too! First, if you notice smudges or streaks after wiping down the countertops, you can use regular ammonia-free window cleaner on it, then wipe it with a microfiber cloth. This will bring back the shine that you love in just a few moments. You also need to protect that finish. Harsh chemicals, like bleach or ammonia, will dull it with time. This includes cleaning wipes that are bleach-based. Also, avoid acidic cleaners. For those who prefer a natural cleaning product, quartz is not the place to use citrus juice or vinegar, as both can dull the finish. Keep your cleaning routine to the soap and water, and nothing more, to protect the finish. Also, do not scrub quartz countertops with abrasive sponges, because that will mar the surface as well. Always use soft cloths, with microfiber being the preferred option. You also need to protect the finish from foods that could damage it. Just like acidic cleaners can damage the finish, acidic foods, like citrus fruits and baking soda, can be problematic. Always use a protective cutting board when working with these foods, and if some spill on the countertop, wipe immediately. Similarly, if you have quartz counters in your bathroom, avoid allowing strong facial cleaners or hair products to touch the surface of the countertop. Finally, make sure you never use a sharp object, like a knife, directly on the countertop surface. Scratches in the finish will ruin its look. Use a cutting board. Cleaning quartz countertops is not a difficult task, but life can often get busy. When you run out of time to get your cleaning tasks done, your countertops may suffer. You can save time by hiring a professional for help with cleaning your home, including your quartz countertops. 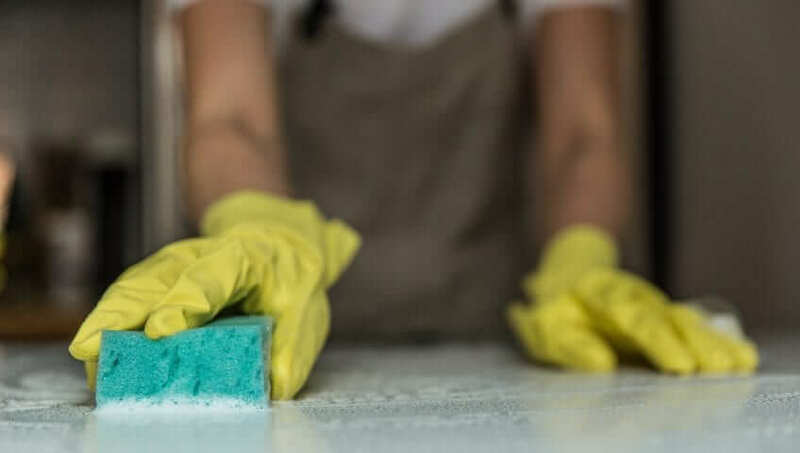 A qualified cleaning service will understand how to safely clean these surfaces so they are sanitary and protected, keeping the finish bright and shiny for many years to come. You will save time and frustration all while knowing that your quartz countertops are properly protected when you choose to invest in professional cleaning.